The traditional American shopping mall is dying—a fate that even the nation’s oldest indoor mall couldn’t escape. Rather than let the historic Rhode Island mall waste away, Northeast Collaborative Architects (NCA) transformed Arcade Providence into a hotspot for micro-loft living. The adaptive reuse, mixed-use project includes 48 incredibly charming tiny apartments, with rent starting at just $550 a month. 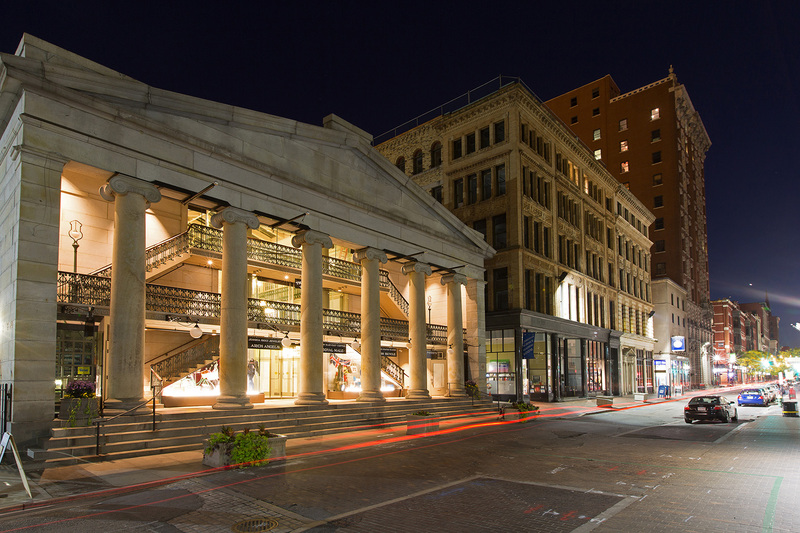 Built in 1828 in the Greek Revival style, Arcade Providence is a beloved landmark—the building was listed on the National Register of Historic Places in 1971—for its airy, light-filled atrium, tall ionic columns, and stately appearance. When the mall closed down in 2008, developer and micro-housing enthusiast Evan Granoff purchased the mall with plans to renovate and modernize the arcade, while respecting its historic design. The $7 million adaptive reuse project transformed the mall into a mixed-use building, with shops on the ground floor and micro-apartments on the top two floors. 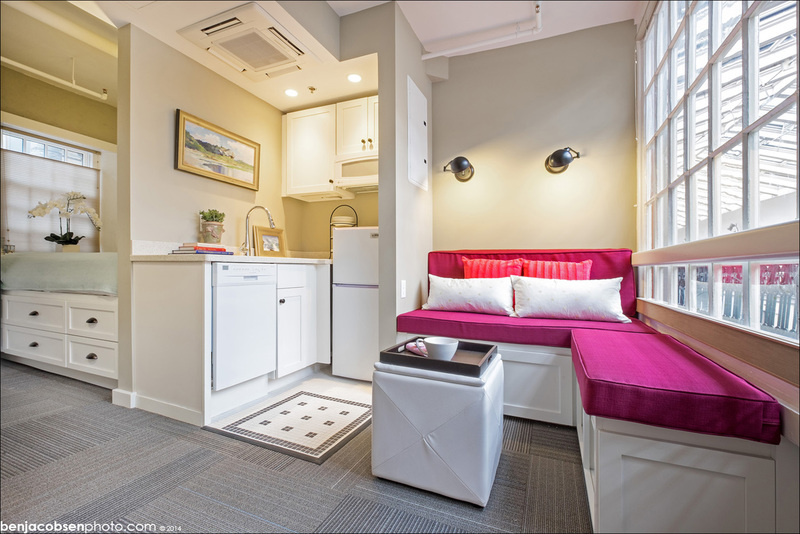 Inspired by cargotecture, the 48 innovative micro-apartments are completely furnished with a bathroom, bedroom, storage, and a kitchen equipped with a fridge, sinks, dishwashers, and microwaves. The majority of the apartments are one-bedroom units that measure 225 to 450 square feet in size; however, there is also a two-bedroom unit and a roomy three-bedroom unit. There are shared amenities including a game room, laundry facilities, bike storage, and parking garage. Rents start at $550 a month for the smallest units, but don’t think you’ll be able to move in right away—there’s still a long waiting list of prospective tenants. Might want to check your facts just a little. Modern malls came into being in the 1950s, with the most prominent example coming 11 years before the Rhode Island Mall. It's a nice story, but don't lace it with lies. It brings your integrity into question. US architects really have some issues with details and style in general. Built in 1828 in the Greek Revival style, Arcade Providence is a beloved landmark—the building was listed on the National Register of Historic Places in 1971—for its airy, light-filled atrium, tall ionic columns, and stately appearance. When the mall closed down in 2008, developer and micro-housing enthusiast Evan Granoff purchased the mall with plans to renovate and modernize the arcade, while respecting its historic design. The $7 million adaptive reuse project transformed the mall into a mixed-use building, with shops on the ground floor and micro-apartments on the top two floors. Inspired by cargotecture, the 48 innovative micro-apartments are completely furnished with a bathroom, bedroom, storage, and a kitchen equipped with a fridge, sinks, dishwashers, and microwaves. The majority of the apartments are one-bedroom units that measure 225 to 450 square feet in size; however, there is also a two-bedroom unit and a roomy three-bedroom unit. There are shared amenities including a game room, laundry facilities, bike storage, and parking garage. Rents start at $550 a month for the smallest units, but don’t think you’ll be able to move in right away—there’s still a long waiting list of prospective tenants. Arcade Providence opened to residential tenants in 2014.